The Cook Islands Library and Museum is a private organization dedicated to the preservation of the history and culture of the Cook Islands. It is entirely run and funded by volunteers whose passion for the country has kept many of the artefacts for posterity. The first ever library in the Cook Islands was a mobile library housed in the back of a bus, which was driven around the island in the early 1950s by an expatriate, an obliging woman from New Zealand, whose name, unfortunately, is lost to history. In the early 1960s, through the drive and support of many prominent community leaders, a series of discussions and public meetings were held with a view to establishing a more permanent facility. From funds raised locally and with voluntary labour, a building was erected on land donated for the purpose by Makea Nui Teremoana Ariki. Those foundation members, included Rev. Bernard Thorogood, Judge Jack Morgan, Stuart Kingan, Tony Utanga, Makea Nui Teremoana Ariki, Ron Crocombe, Sir Tom Davis and many others. Architect Ken Mills designed the building (steel frame with concrete block panels, wooden ceiling linings and corrugated galvanised iron for the roof). The building was completed in 1963 and opened on 22 December 1964. 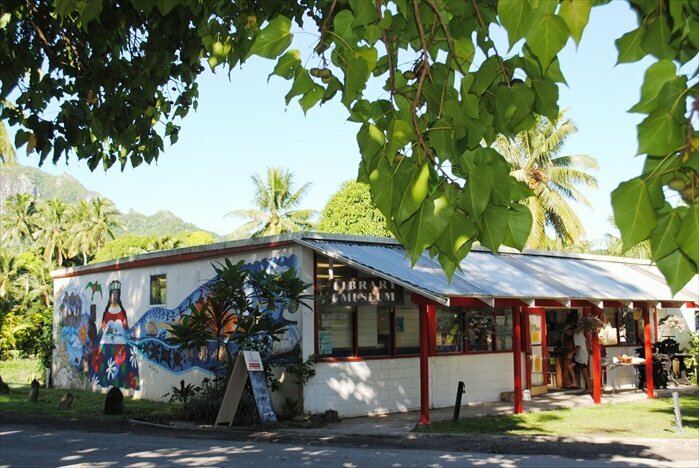 Conveniently located within a pleasant parkland of exotic and indigenous trees, adjacent to some of Rarotonga’s oldest historic buildings associated with the early missionary period, the Library and Museum is a short walking distance from the main business centre of Avarua, the capital and largest town. The library and museum is run by two permanent staff-members, with the support of 6-8 volunteers. The current library membership stands at around 1000 active members, with visitor numbers to the museum averaging about 500 per month.